Resiliency Checklist — Is Your Community Ready for the Next Big Flood? 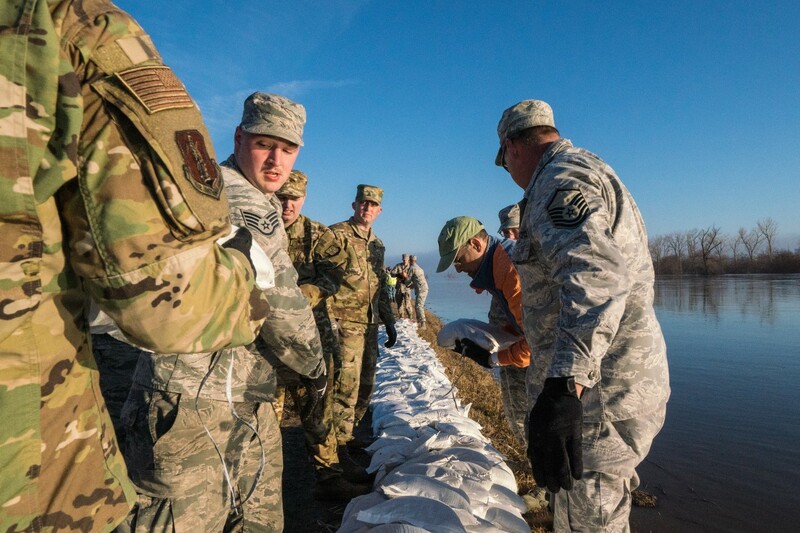 To protect a nearby airport and surrounding communities from flooding, Missouri National Guard troops lay sandbags along a levee in Elwood, Kansas on March 22, 2019. Photo: U.S. Air National Guard/Tech. Sgt. Patrick Evenson. Click to enlarge. TipSheet: Resiliency Checklist — Is Your Community Ready for the Next Big Flood? As historic floods devastate Nebraska and other Plains states, many communities have only begun efforts to recover. It will take a long time and it will be hard and expensive. Of course, there is only so much that can be done to anticipate, prevent, plan and prepare for such floods. But “resiliency” is more than a buzzword. Environmental journalists can help their communities by focusing stories on actions and solutions that may make them more resilient in the face of floods. Floods bring human misery and economic damage, as the current floods centered on the Missouri River system demonstrate. Three people have died so far. Damages will be in the multiple billions. You can expect such disasters to happen again, and happen elsewhere as well. Moreover, such catastrophes may happen more often, and cause more harm, in the coming era of climate change (may require subscription). There are so many possible components of flood resiliency that the TipSheet can only outline them. If you dig into these items, you will often get stories. Flood insurance. Does your community qualify for federal flood insurance? Get flood-plain maps from the Federal Emergency Management Agency. Then ask if they truly reflect flood-plain risks. Sometimes county flood-plain managers can help. Drinking water plants. The treatment plants which supply public drinking water systems are often in flood plains or near flood-prone waters. Floods often knock them out. Sometimes pollution is the problem. Sometimes it is equipment and infrastructure that is vulnerable to flooding. Talk to your local utility about flood plans … and solutions. What about alternate water supplies? Sewage treatment plants. Municipal sewage plants are also often near or in flood plains. Floodwaters can damage or overwhelm them. Some combined storm-sanitary systems have to discharge sewage during high flows. The immediate problem will probably be water pollution (and the threat of disease.) Talk to local plant managers about vulnerabilities and flood contingency plans. Stormwater management. This one’s a big subject. Does your community have storm drains and storm sewers? What is their capacity? How well do they work? Do they have a discharge permit? Are there other things, like tunnels, that store stormwaters? Does your community follow EPA’s best management practices for stormwater? In what shape are your ditches and culverts? Are developers required to build storage ponds? Does your community build “green infrastructure” to retard or absorb stormwater? Roads and bridges. When floodwaters knock out roads and bridges, then that makes rescue, evacuation and relief supply all the more difficult or even impossible. Designing and building (or rebuilding) them right — and maintaining them, improves resilience. Wetlands. In many situations, natural wetlands capture and store floodwaters for a while, lessening the impact of floodwaters elsewhere (maybe where you live). Sometimes farmers and real estate developers view wetlands as the enemy, and push to fill or drain them. Where are the important wetlands near you? How do they affect floods? Are they threatened or protected? Building codes. How a house or building is designed and built makes a big difference in its vulnerability to flooding — and ability to recover. Elevation is key (in some coastal communities houses are built on stilts). Site grading and drainage is also critical. Some building materials are more vulnerable than others. What provisions in your local building codes help flood resiliency? Zoning laws. Zoning laws govern what can be built where. Some places, like Harvey-devastated Houston, don’t believe in zoning. Many do. Communities only qualify for federal flood insurance if they keep vulnerable buildings out of flood plains. How does your county’s zoning affect flood resilience? Dams and water control structures. Dams and other water control structures make a huge difference as to how floods affect communities. Sometimes, flood control is an explicit purpose of a dam: By storing high flows it can moderate them. This doesn’t always work, though, when dams are poorly engineered, built, maintained or operated. Sometimes flood flows are too great (may require subscription). When this causes dam failure or unplanned releases, catastrophe can be multiplied. Talk to your upstream dam agency. Levees. These are another kind of water-control structure meant to prevent flooding. Often they work. But if they are under-built, eroded or poorly maintained, levees can cause sudden flooding in the areas they are meant to protect. By taking natural flood plains offline, levees can actually worsen flooding downstream or across the stream. That’s by no means the end of the list of resiliency factors. Among the many other things to consider are farmland (the vulnerability of crops to floods), crop storage vulnerability, the resilience of hospitals and nursing homes (elevation, emergency power, evacuation plans), and the possibilities for flood-related erosion and landslides. Here are a few sources that may help in your flood resiliency reporting. Insurance companies. See, for example, the Flood Resilience Portal put out by insurance company Zurich. * From the weekly news magazine SEJournal Online, Vol. 4, No. 13. Content from each new issue of SEJournal Online is available to the public via the SEJournal Online main page. Subscribe to the e-newsletter here. And see past issues of the SEJournal archived here.